Painting a luminous sunset can be tricky. I used a combination of materials and techniques to paint the scene shown here. Today I will share the steps to paint a luminous sunset using watercolor and gouache paint. 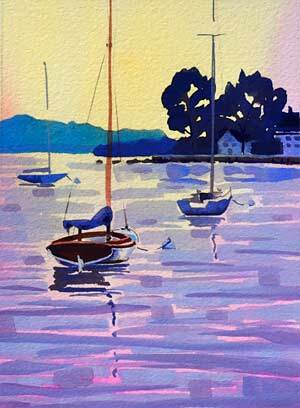 Boats Moored at Watch Hill, 5×7 watercolor ©2018 PJ Cook. My inspiration for this colorful painting is from a recent trip to Watch Hill, Rhode Island. It is a quaint seaside village in the southern section of the state. There are always interesting boats moored in the protected harbor. To start lightly draw the scene in pencil on Arches 140 cold pressed watercolor paper. This is my favorite paper but you can use whatever you have available. I always stretch and dry watercolor paper before I paint. Wet the entire paper with clear water. Drop in a variegated wash in yellow and violet onto the wet paper. You can see the top part of the painting has the yellow paint and the bottom is the violet. I used Permanent Rose for a violet and any light yellow will work nicely, I used Azo Yellow. Let the colors blend and tilt the paper to move the paint where you want it. If you look closely there is rose up into the sky on either side and the yellow drops down through the middle of the paper. Let this dry. Following your sketch paint the background with cerulean blue in gouache paint. As you move forward darken the color with ultramarine blue. The trees and land to the right is the darkest value. Using the paint on your palette mix a violet with white gouache and start adding the ripples in the water. In the distance the violet is a cooler blue shade and as you move forward towards the bottom, warm the color with more of the rose paint. Use a few different values and brush strokes in the water but leave some of the background rose peeking through! This is important. Let the initial watercolor wash show thru in areas to create cohesiveness and color pop! Paint the boats next using colors on your palette. I added burnt sienna along with the paint I already had mixed for the foreground boat. I added the most detail to the nice wood sailboat. This is a good technique to create a luminous sunset or any scene that has bright colors. Creating the initial colors with a watercolor wash is a nice way to add cohesiveness to a strong color painting. As you paint, decide how much of the background color to leave untouched. Try this painting technique and let me know how it works. Leave any questions about the tips below in the comment box and I will be happy to answer. Hope you enjoyed painting a luminous sunset tutorial!